My name is Stephanie Craft. I have lived in Japan for 10 years now. My husband and I moved here 7 days after our wedding. We were college sweethearts who waited 6 years to get married and another 5 years to have our first child. Violet was born, by medically required cesarean, on October 1, 2009 in Ofunato, Japan. I found out I was pregnant 10 days after I was told I would have extreme difficulty getting pregnant naturally. I was actually pregnant at the appointment but it was too soon to show up. I knew right away that I would breastfeed. (read my breastfeeding beginnings here) There was never a question in my mind about it. I love breastfeeding and I am passionate about advocating it among my friends and community. I have always breastfed on demand. From the moment she was born and continuing to this day, Violet gets to nurse whenever and wherever she needs it. My husband and I practice Gentle Parenting but didn’t have a name for it until I found some readings on gentle parenting by mistake online and I realized it was very similar to what we were already doing. 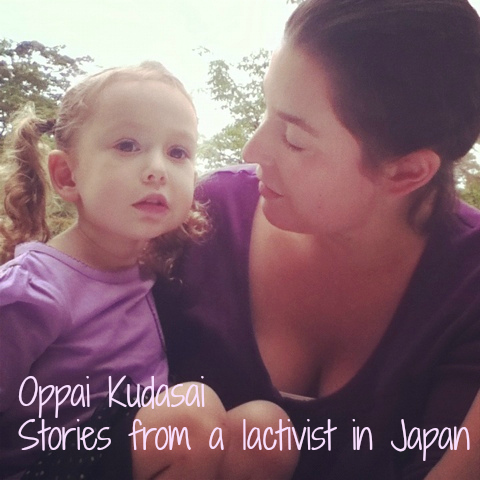 I created this blog to reach out to other breastfeeding moms and to share our stories. I don’t have a physical support group or place to meet other English speaking moms. I have found many wonderful online groups that have other like minded moms though. It has been challenging and also very rewarding to raise our child in a foreign country. We get the benefit of making our decisions based solely on our own desires without the influence of our native society. Also because we are foreigners in this country people do not try to influence us with their opinions as to how we should parent. I think that is particular to Japanese culture. In America, people don’t think twice telling you how you should do something whether you are from America or not. I am not trying to dis on my own country. 🙂 The other side of this independence is the complete independence. I don’t know if that makes sense or not. Because we are so far away from our family we do it all by ourselves. We don’t have mom and dad coming over to help out when one of us is sick. We don’t have anyone to watch Violet when she has to stay home from school (not that I would want anyone but me doing that anyway). We don’t get to go out on dates because babysitting is not a common thing here. And Violet doesn’t get to see her grandparents, aunts uncles and cousins but once a year. All this aside, she has had a very exciting life here in rural Japan. She is growing up bilingual and also learning to appreciate 2 cultures at the same time. Our town was harshly devastated by the tsunami on March 11. Click here to read our story of survival. I recently published a children’s book about a breastfeeding toddler. Mama’s Milkies is beautifully illustrated by the very talented, Katie m. Berggren.